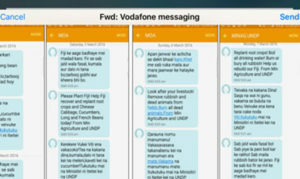 Responding to the Fiji Government’s call for strengthened support from the private sector and with support of the European Union (EU), the United Nations Development Programme (UNDP), in partnership with the Pacific Community (SPC) has facilitated an innovative partnership between the Ministry of Agriculture and Fiji’s telecommunications companies to use text messaging service to inform mobile phone users in affected areas. The text messaging system, which was piloted in Solomon Islands and Vanuatu after tropical cyclone Pam and in Tonga for disaster preparedness, will now be used in Fiji. It will allow key messages relating to safe water consumption and agriculture to be shared among the 150,000 numbers registered with Vodafone and Digicel in Tailevu, Nabouwalu, Yasawas, Taveuni, Lomaiviti, Korovou, Ba, Tavua, Rakiraki, Labasa and Savusavu. With this partnership, Digicel and Vodafone have significantly reduced the costs for developing the platform and the distribution of the text messages. “We are very thankful to Vodafone and Digicel for initiating this and also to UNDP for facilitating this partnership and support to the Food Security Cluster”, said Permanent Secretary for the Ministry of Agriculture, Uraia Waibuta. “The messages sent out by Vodafone and Digicel will complement the assessment efforts of the extension officers,” Waibuta added. “This text messaging platform will allow us to reach and receive feedback from affected communities much quicker,” he said. “UNDP, through the PRRP, is currently supporting the Ministry of Agriculture through its food security cluster, as well as other clusters,” Ms. Lubrani said. The private sector as a profit driven entity often induces innovation. These innovative approaches during times of disasters can be beneficial for affected communities. “The European Union is committed to helping communities become resilient to disasters and this innovative use of the telecommunications networks means communities are better informed in real time which underlines why working with the private sector is critical to developing disaster resilience in the Pacific region,” said EU Ambassador to the Pacific, Mr. Andrew Jacobs. Funding to ensure these messages reach every mobile phone across the country is also being provided by the European Union through the Pacific Community (SPC). Digicel’s Regional Head of Mobile & Digital Advertising, Morika Hunter, said “mobile phones are a valuable tool to gather data directly and quickly from the people during times of disasters.” “Through the Digicel network, we are able to geo-target communities which will allow our partner’s the Ministry of Agriculture and UNDP to gather specific information relevant to them,” she said. “For devastation of this magnitude, it will require real partnerships to ensure messages reach those that are most affected and as the largest telecommunications network in the country, Vodafone is happy to support the work of the Ministry of Agriculture,” Mr. Lal said. While the full impact of this disaster is being assessed, UNDP and its partners stand ready to assist the Fiji Government with humanitarian and recovery efforts.